This map presents a geographic information system based on an inclusive view of the region. 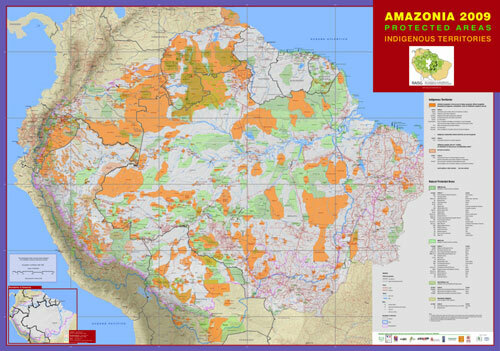 The principal purpose of the publication is to contribute to overcoming fragmented visions and to support integrated local, national and transboundary initiatives and processes that help consolidate protected areas and indigenous territories as important components of the conservation and sustainable use of this ecosystem. It represents the first product of collaborative efforts of a network of Amazon institutions to integrate and improve their previously existing databases under the framework of RAISG.